When you first log in to Innoslate, you will be automatically directed your 'Organization Dashboard,' which serves as your organization's home page. Here you will find your recent projects and a description of your organization, as well as a guided tour to help you get started with Innoslate. You will automatically be directed to your 'Organization Dashboard' upon logging in to Innoslate. If, however, you are already within a project and wish to return to your 'Organization Dashboard,' you may do so at any time by clicking 'Demo' (or your organization's name) in the breadcrumbs located at the top left of your Project Dashboard or any project view. Here you will find a brief description of your organization, if provided. When you first sign up for Innoslate, you will notice a large blue banner at the top of your 'Organization Dashboard' that welcomes you and gives you the option to start a guided tour of Innoslate. Click 'Start Guided Tour' to begin your tour. You will be directed through a series of prompts, which will have you select a sample project to view. It will also ask you to customize your tour by selecting at least two areas of interest to you within Innoslate. Follow along through the prompts to learn more about what Innoslate can offer. You can stop the tour at any time by clicking the 'Dismiss' button located at the top right. * Note: You may follow along through any of the guided tour projects at any time, by clicking the link in the banner of your 'Organization Dashboard.' If you no longer wish to see this banner, you may remove it by clicking the 'Dismiss' button located at the top right. When you first log in to Innoslate, you will be automatically directed your ‘Organization Dashboard,’ which serves as your organization’s home page. Here you will find your recent projects and a description of your organization, as well as a guided tour to help you get started with Innoslate. 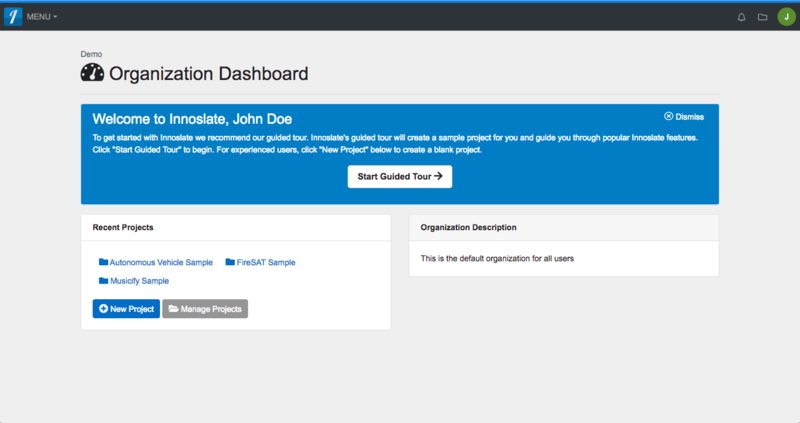 You will automatically be directed to your ‘Organization Dashboard’ upon logging in to Innoslate. If, however, you are already within a project and wish to return to your ‘Organization Dashboard,’ you may do so at any time by clicking ‘Demo’ (or your organization’s name) in the breadcrumbs located at the top left of your Project Dashboard or any project view. When you first sign up for Innoslate, you will notice a large blue banner at the top of your ‘Organization Dashboard’ that welcomes you and gives you the option to start a guided tour of Innoslate. Click ‘Start Guided Tour’ to begin your tour. You will be directed through a series of prompts, which will have you select a sample project to view. It will also ask you to customize your tour by selecting at least two areas of interest to you within Innoslate. Follow along through the prompts to learn more about what Innoslate can offer. You can stop the tour at any time by clicking the ‘Dismiss’ button located at the top right. * Note: You may follow along through any of the guided tour projects at any time, by clicking the link in the banner of your ‘Organization Dashboard.’ If you no longer wish to see this banner, you may remove it by clicking the ‘Dismiss’ button located at the top right.